Watching northbound traffic creeping along on I-5 made me wonder what’s happening with the long-standing plans for third lanes. The answer is not much, other than continued planning, which moves much slower than even the traffic on a summer Sunday afternoon. I was crossing I-5 on the Santiam Highway overpass after a bike ride into the wilds of Linn County and stopped to record a few seconds of video of the traffic below. 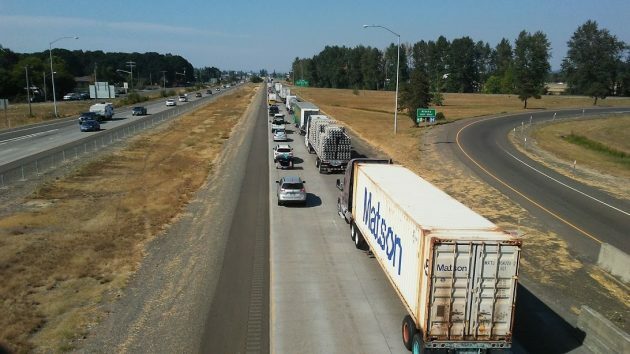 Several years ago ODOT spent a good deal of time and money getting public comments and figuring out how to handle the growing traffic between and around the Santiam and Knox Butte interchanges of the freeway. It came up with plans to add 12-foot-wide lanes in both directions between the interchanges, add a southbound on-ramp at Knox Butte, build sound walls, and make changes at interchanges to the north. All this would cost tens or hundreds of millions of dollars, and there’s no money allocated to these projects. But planning and design work continues, according to ODOT material available online. Lots of freight traffic, as you can see in this view north from the Highway 20 overpass in Albany Sunday afternoon. Not even leaving in the middle of the night works. Last Thursday I left at 10 pm for what should have been a one hour trip north, and it took 3 1/2 hours. Highway planners can’t just deal with the here and now. They have to plan for 20 years in the future. The costs for matching future needs is always more expensive than a quick fix, and quick fixes don’t often work long and cost even more to fix later. The cheapest short-term fix is getting vehicles off the road. We know how to do it. Ride sharing, public transit, fewer trips, smaller vehicles, more rail shipping instead of trucks, off-hours travel. But we, myself included, find it very hard to give up the convenience of our cars and driving alone. You get what you’re willing to pay for. Just what do we get for the money we spend to support 5000 ODOT workers which easily cost with benefits, office costs, vehicles, etc at least 500 million annually. I know you and Ray C will hurry to enlighten me. Apparently whatever we’re paying ODOT is inadequate. But the president’s “Infrastructure Plan” (remember that long-lasting policy initiative from Spanky Trump) wherein the Feds would give 20% for every 80% local governments and/or the sacred Private Sector would kick-in…that’s still a possibility if Trump evades Mueller and polishes his interpersonal skills. If the nation, in an attempt to become great again, were to enact this 20/80 Federal/State/Private Sector scheme, Mr. Hering’s tome of yesterday – having to do with Toll Roads – would likely become the norm, in which case any tax dollars going to Road building/maintenance would include dollars going to the various workers rather than to ODOT employees. Still, it takes money to run the roads. It’s all in who you want to pay. There you go. It will take you several days to go through all the info. Roads, bridges , public transit, engineering, design, road maintenance, snow management, highway signs. etc., etc. etc. 5,000 employees and a state of 98,466 square miles means one employee per 19.69 sq . miles. There are a little over 8,000 miles of state highways, and double that and more of lane-miles. Plus things like lights, reader boards, TripCheck road conditions, cameras, emergency service trucks, etc. Seriously, it will take you days to understand all the work that ODOT is responsible for. We live in the 21st Century. Things are a lot different than it used to be when Grandpa was around. This Grandpa is still around and agrees that things are a lot different. How did we ever build the I-5 in the first place? Today’s mess would have required at least 10000 ODOT employees as we had to start from scratch with buying properties. Now, as the picture shows, lanes are already there and just need to be paved. But we are, of course, so much smarter and find imaginative ways to forever require new permits and regulations. Using the funds we pay for ODOT would solve the problem. Give them shovels. President with vision and honor. That’s a clear lie. ODOT and the Feds did it with what they had when they did it. Have other proof? Show it. I won’t hold my breath. I agree! We ARE smarter. Now we build to resist earthquakes. We make sure the drainage doesn’t wash gas, oil and other noxious chemicals into streams and groundwater. We make shoulders wider and put up barriers to stop cars from going into opposing traffic, and much more. YAY!!! Id prefer to use money to give people like you some jobs, so you don’t denigrate honest working people trying to do their jobs. So much hate and derision you have there. Absolutely. Maybe intermediate-term and long-term as well. Maybe best as well as cheapest when you take into account the environment, quality of life, health, and happiness. Good governments will provide incentives that make it profitable for people to do exactly what Bob suggests.